I have a secret fantasy to start an Etsy shop. I even have a plan for what I’m going to make and sell (one that I’m not even close to setting in motion…I will though!). My husband sent me this great link to Jared (who is apparently quite good at using a program written in Flash AS3…whatever that is). 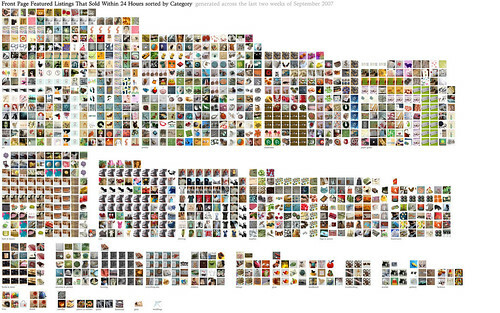 He graphed (in this image) all the items that were featured on the front page of Etsy that then sold within the day. It was generated from data spanning the last two weeks of September 2007.